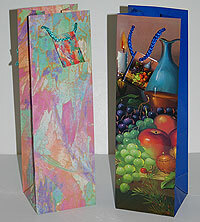 Tall Bottle Gift Bags. Great wine giftbags size. Fill with Excelsior or other shred to finish off your gift bag. 5 bags per pkg and each gift bag measures 4 x 13 inches.